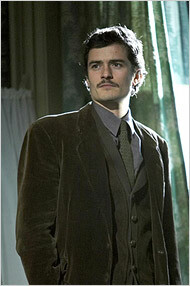 Orlando Bloom: perhaps he’d sell more tickets sans moustache? In London, the play, not the player, is still the thing, especially since you don’t find Judi Dench and Maggie Smith together on stage all that often: their West End duet in David Hare’s Breath of Life looks unlikely to be repeated. In the meantime, Juliette Lewis tanked in “Fool For Love,” Jessica Lange has done less well on each of her three West End engagements, and tickets proved far from impossible to obtain for Daniel Radcliffe in “Equus,” or Orlando Bloom’s ongoing run in “In Celebration”: the anticipated Julia Roberts-style hysteria never quite hit London. He cites Madonna as one of the few people who could make the English rush the stage door. Are we really so much more susceptible?